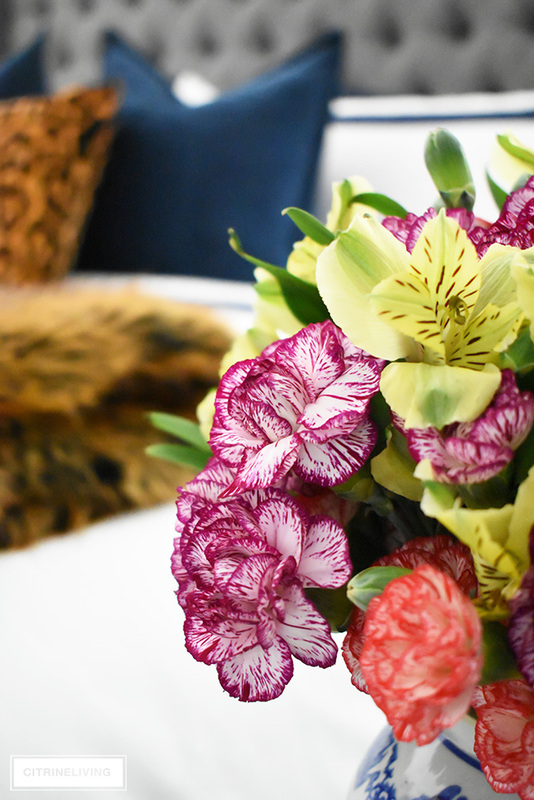 Can you believe I’m sharing our dining room makeover reveal today? Even though you’ve already seen a few peaks, I am so thrilled to finally be unveiling my third big makeover to all of you, after all this time! 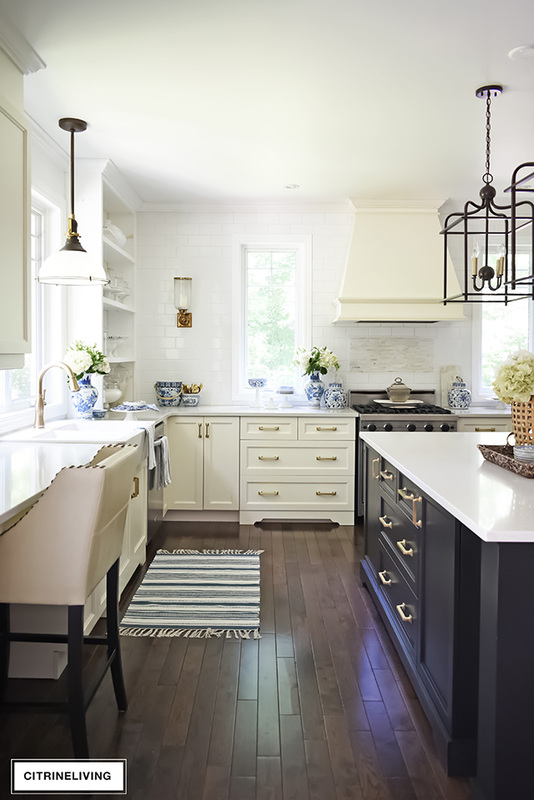 First – we tackled our kitchen, which I think you’ll agree, is now elevated to another level completely – click here to see it. Second – gorgeous, new white sofas in our living room were major game changers, and we now have a chic, bright, airy room we love – you can see it here, if you haven’t yet. Thank you so much, to each and every one of you, for your patience while I tackled all of these new projects, while getting ready for Christmas in our home, as well as here on the blog…I had hoped to get all of these reveals published before the holiday rush, but somehow it got the best of me! So here we are today, after I’ve been talking about my plans for our dining room since the summer (click here to read the post), and I cannot wait to show you! We installed new moldings, painted our black walls a light grey from top to bottom, updated our chandelier, rug and table, and finally, I painted a new, very dramatic piece of artwork. I think you will be as awe-inspired as I still amm every time I walk by. So, please, come in to our brand new dining room and take it all in with me! 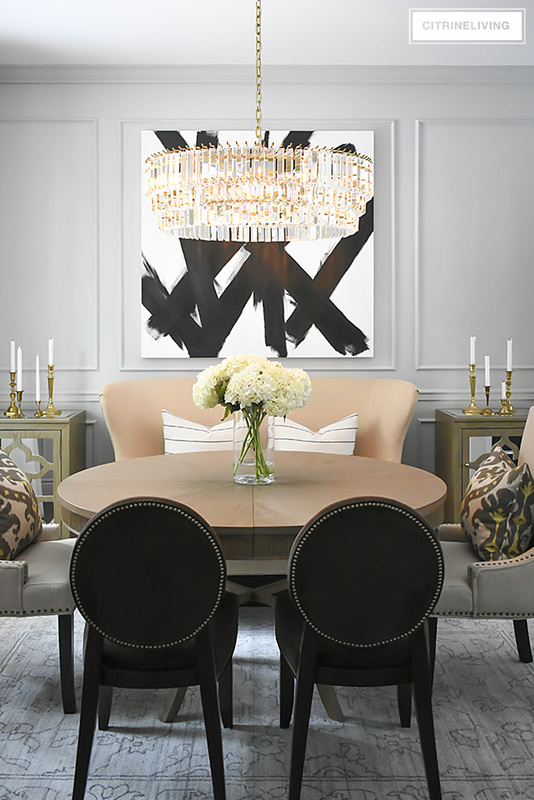 Once again, I’d to extend a very big thank you to Perigold, for partnering together with me to make this dining room makeover reveal possible. We are so in love with all of the pieces we found from Perigold’s, incredible selection – from the quality of each item, to the fantastic customer service to help us find the perfect pieces, to their white glove delivery – we could not be more impressed. Our new dining room is a showstopper, and I truly think you’ll all agree! While I’ have received product in exchange for writing this post, all selections, reviews and opinions are my very own – I only endorse brands and products I truly love! *Affiliate links are provided throughout, or at the bottom of this post for your shopping convenience – see my full disclosure policy here. OUR DINING ROOM BEFORE – BLACK WALLS, DARK FURNITURE + PATTERN GALORE! As many of you know, I loved our dining room and it’s black walls – they were sophisticated and made a very bold statement. Everyone who came into our home always commented on them, and how much they loved them. You may also remember my recent dilemma about whether or not to paint them, and the colors I was contemplating (read it here). I truly wrestled with the decision, I loved these walls so much and I was almost afraid that our dramatic and unique space might become a little too ordinary, losing that wow factor we love. It was an emotional decision to make! We’ve lived here going on nine years now, and in the end, I decided to go for it – it was time to change things up. You can see the transformation this room has taken on! Quite the change…have a look here to see all the different phases it’s gone through. WELCOME TO OUR DINING ROOM MAKEOVER REVEAL! 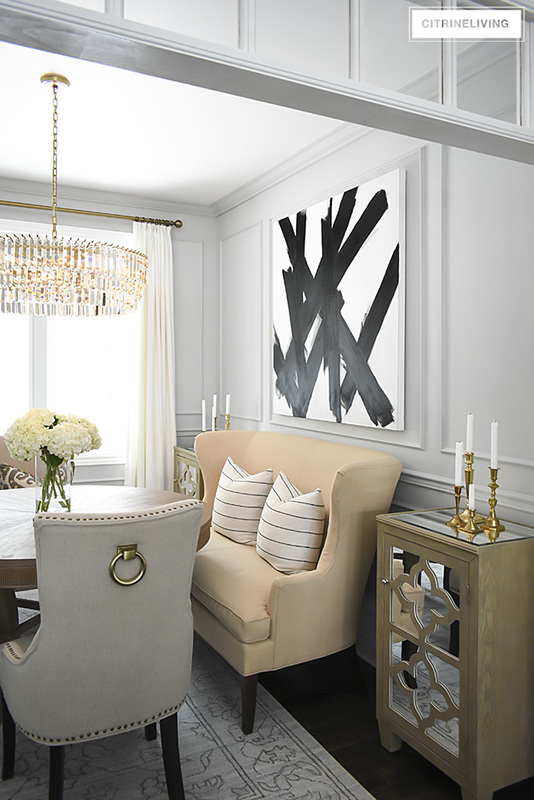 We painted the walls Stonington Gray by Benjamin Moore, and one of the most important design decisions we made in here, was carrying the paint color from the crown molding, all the way down to the baseboards, for a more traditional look that opens up the room and visually enlarges the space. My handy hubby, Neil, installed more moldings above the existing chair rail, also to reinforce that traditional feel I was after. What’s old is new again – this wall treatment is something you’d find centuries ago in European interiors – I wanted to bring that feel into this space. 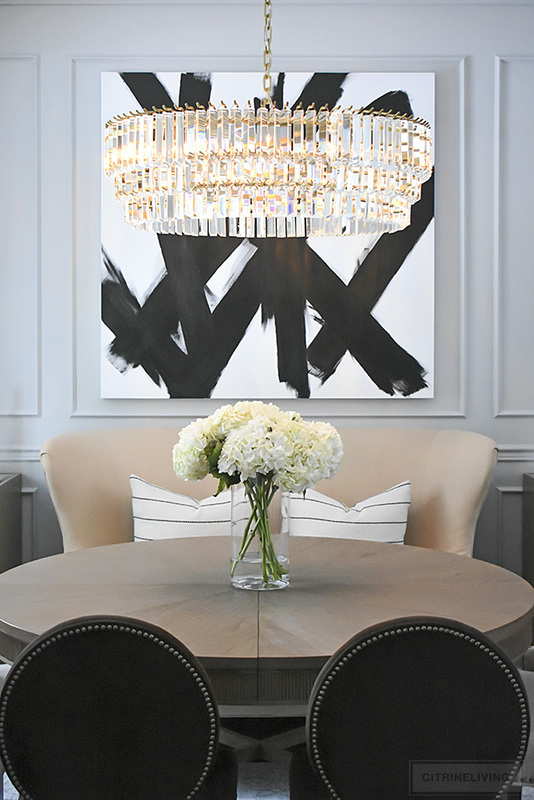 To counterbalance the traditional look, and keep the feeling modern, crisp and clean, I chose our new spectacular chandelier by Robert Abbey – honestly, I don’t think I could have picked a more perfectly dramatic piece for this room! While it’s large in scale (32″ in diameter) and very glamorous, it’s also streamlined and quite contemporary, which I absolutely love. It was a bit of a risk, as I was somewhat concerned it would be too large for this space – but I always choose to go larger scale than smaller – it always makes a bold and chic statement and this risk has definitely paid off in our dining room. The crystals are so beautiful and the light it reflects just sparkles and shines! 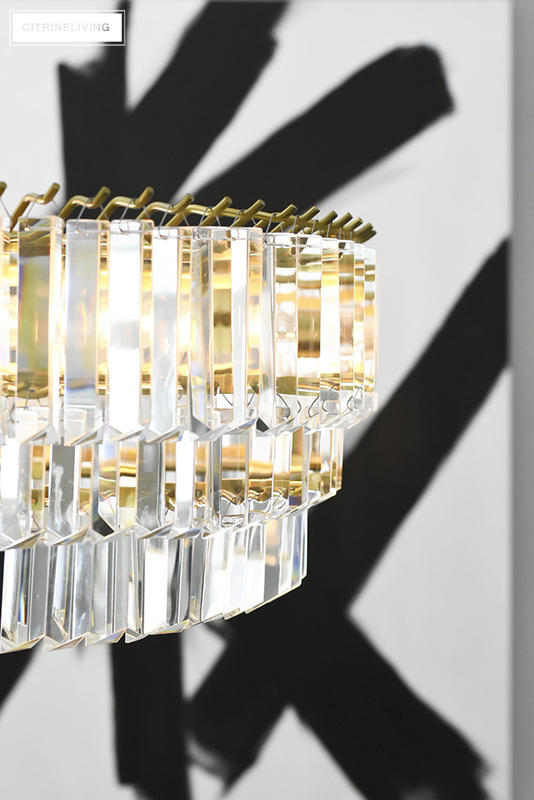 Even when the lights are off it sparkles – it truly is the showpiece of the room. Our custom drapes from Tonic Living, the drapery hardware, pillows, chairs, settee, and side cabinets have all stayed the same – it’s remarkable how different a space can feel, just by swapping out a few key items and changing the wall color. 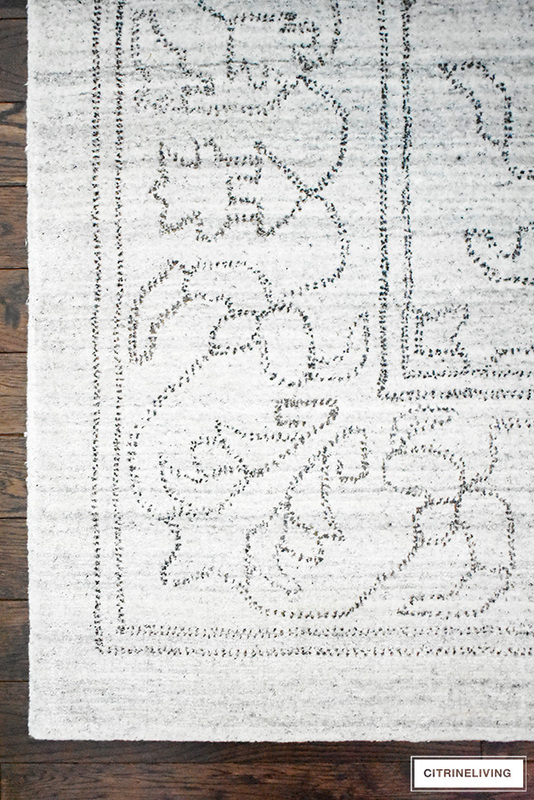 Let’s talk about our stunning new rug from Surya. I am so in love with this chic and elegant piece. 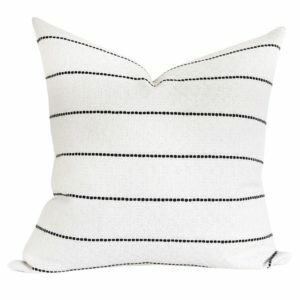 The pattern has a slightly vintage vibe, is made of bamboo, rayon, silk and cotton, and so incredibly soft underfoot. It’s 6′ x 9′, and is slightly smaller than our previous rug, but I find it actually makes our small, 9′ x 10′ room feel even bigger than before. I also love how grounds whole space and balances the wall color so beautifully. I especially love the continuity and flow it provides from the entryway, and how well it compliments that space and the rug. 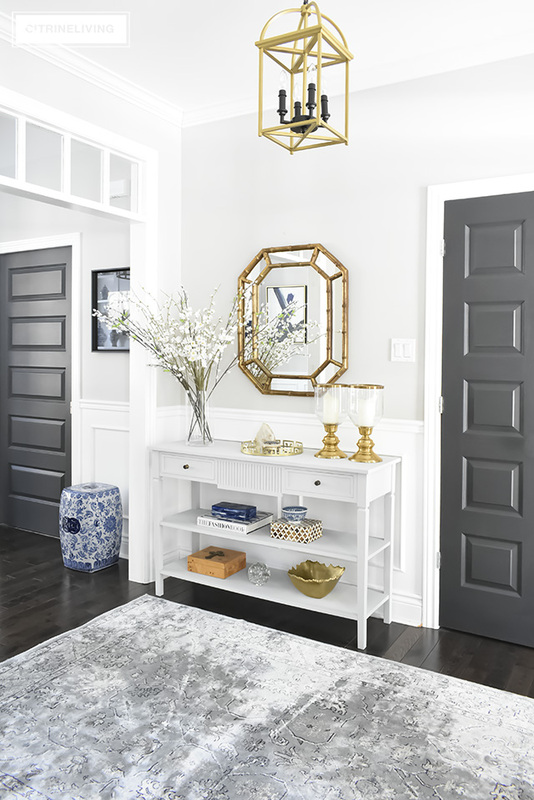 If you haven’t seen our entryway reveal from last winter, you’ll want to! 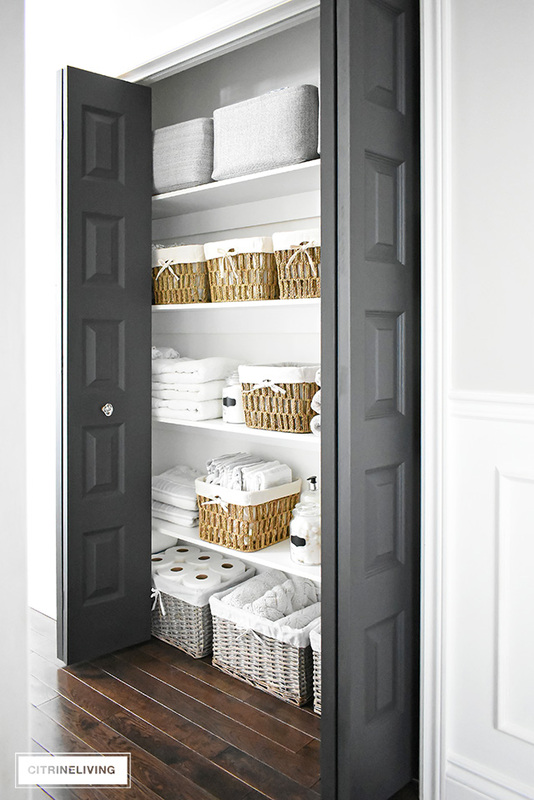 It was a two day project that sparked all of the updates in our home that have followed since. You can read all about it here. The ivory and grey tones are soothing, and the pattern is elegant and subdued with a modern take on a traditional print that I love. One of the absolute musts for me in this makeover, was the table. I loved the lines of our existing table, and I had been trying to decide for a few years now whether or not to paint it. While it would have been fabulous, I didn’t want to take on the project right now, with everything else going on. It had a lot of intricate detailing that I was not ready to deal with! When I stumbled on our fabulous new dining room table by Hekman, I fell hard instantly. I love that it extends, as our previous one had as well. 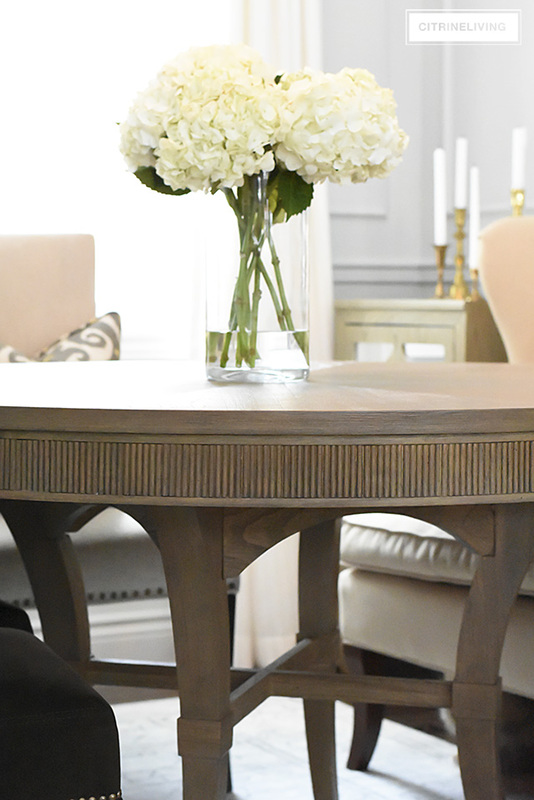 It’s so similar to our previous table, with this gorgeous reeded edge detailing that I just love, and the color is exactly what I wanted – a medium tone that’s not too light, with just the right amount of contrast for our dining room. The size is 54″ round, and 54″ x 74″ fully extended. It has beautiful, elegant legs with a slight curve, versus the large pedestal on our old table. This little project of mine was so simple to do! I’ve never really painted an abstract like this before, and I’ve never tackled a painting of this size either. I love to draw and paint and find myself with very little time lately to do so. I have a collection of fashion drawings that hang in our daughter’s bedroom (see it here), and it’s been many years since I’ve created those. I was very nervous to tackle this piece, not ever having done anything like this before, but I just dove right into it. I figured if I didn’t like it, I’d paint over it! I used a 48″ square canvas, black and white acrylic paint, and a wide paintbrush. I painted the canvas white first, then took the black paint and went to town. I knew I wanted linear strokes verus curvilinear, so I slowly painted one stroke at time. At first when I thought I was finished, it was a little too messy looking for my liking, so I went over the strokes a second time, giving them cleaner, sharper, more concise edges. This piece was inspired by the art in our living room (we have a complementary pair in there), by artist Christie Adelle – I fell so hard for their stunning, modern edginess, and wanted to bring that same feeling into this room, which I knew would make a very bold statement. I am so happy with the results! It cost me less than $100 and took about two hours. Not bad for a bold, statement-making piece! I do still have to sign it and we’re planning to build a thin frame around it and paint it gold to complete it and help it pop off the wall a little more. I hope you love our dining room makeover reveal as much as we do! All of the decision-making, contemplating, and toiling over whether or not to paint the walls has truly paid off. I know so many of you tried to talk me out of it! I almost talked myself out of it, and so did Neil. We didn’t want to lose the wow-factor we loved so much – but taking the risks has most definitely paid off in the end. 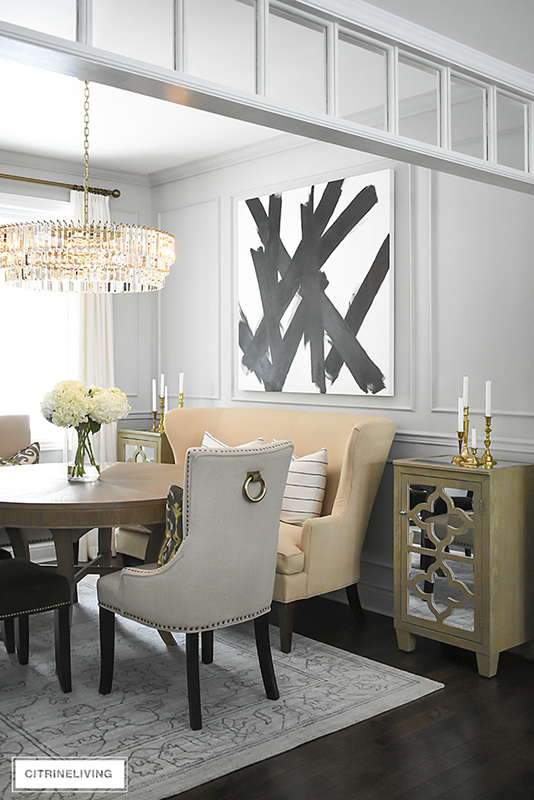 CURATING A LAID-BACK LOOK IN YOUR DINING ROOM + SOME CHANGES! I love your room makeover, so beautiful. I loved the before, but I truly think this is so much more elegant and up to date. Gorgeous. I’ve been waiting for your dining room reveal, Tam, and let me say how absolutely stunning it is. 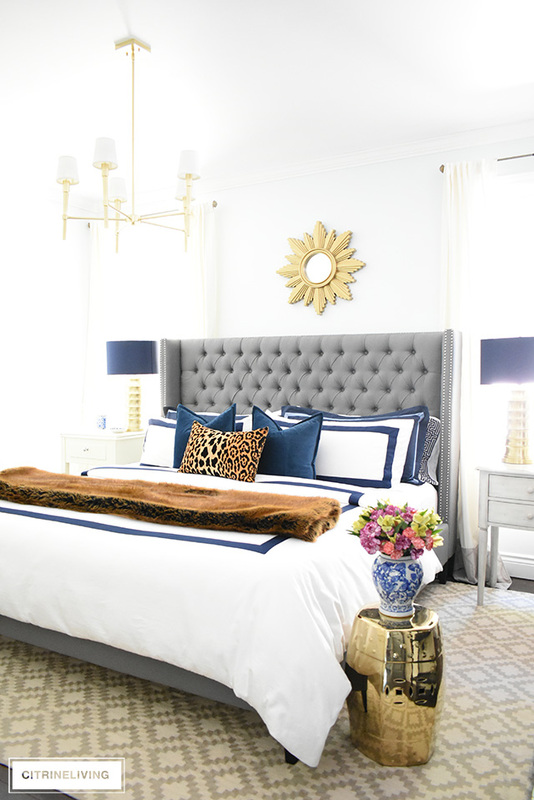 As you know, everyone loved your dark walls because they were truly outstanding, but the new paint and mouldings have made it an entirely new room, so chic and modern. Love your art work also. Love your new dining room Tamara! The chandelier is amazing! I love that you painted your art and it’s perfect on the new wall color and millwork! I love the fresh new look! Christmas will look beautiful in this space, it’s so fun to watch you create your beautiful designs. Cheers! It’s beautiful … very elegant indeed – my space is small also I love the two side pieces on either side of the picture. Although i did love the black walls too … they were eye catching. Thank you very much, Marnette! I loved them too, but I really don’t miss them! I thought I would!! It’s absolutely fabulous, Tamara! It certainly does still have that wow factor and that chandy is just stunning!! Well, done! I love everything about it!! I want you to know that I tell everyone that of all of the design blogs I follow, I really believe your esthetic is the most elegant and noteworthy!! I’m loving it! The moulding adds a lot to the overall feel of the room. Your chandelier is stunnng! Go big, or go home! What did you do with your mom’s lovely painting? It was a statement piece. I’m sure we’ll see it pop up in another room. Trace thank you so much! I knew it would win you over, even if you didn’t want me to paint! Muah! Thank you! This is a mixed grade oak, with a walnut stain, unfortunately I don’t have the color name! I agree with what Candy Thomas wrote. I am knew to your blog and love love your style, talent and your descriptions. The dinning room is amazing. I love the fact that you added your own art. Thank you so much Bridget! I am so happy you love it and thank you do much for the lovely compliment – that truly means so much to me, I’m so happy you found my blog! I’m so happy you like it all, thank you!! I love this room! 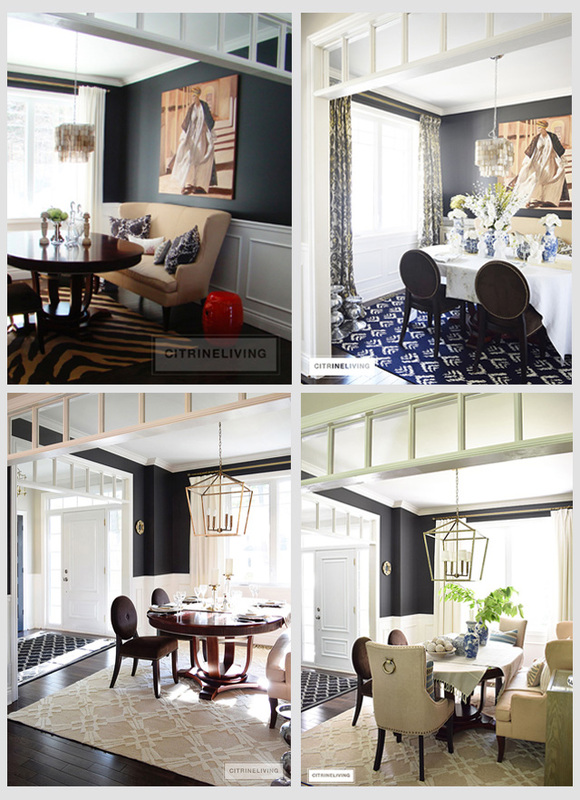 I am considering similar moldings in my dining room and was curious what you did below the window. It almost looks like the wall below is white to match the window trim? I have a bay window and was considering keeping the walls the windows are on white. Hi! Thank you so much! 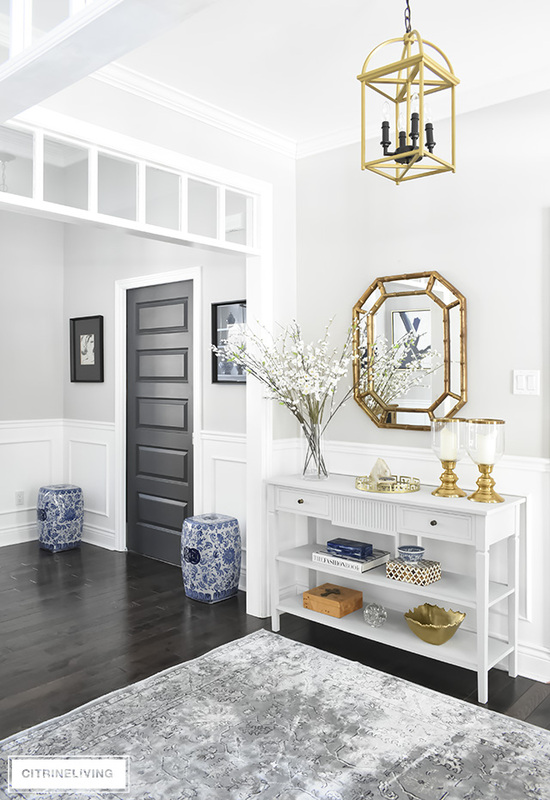 The walls are actually all the same color – Stonington Gray by Benjamin Moore – only the trim around the window and doorways are white!